Hot this week: The UN acts on Syria, but is this an act? This was at a press conference associated with her film Woman in Gold. Thieves entered the remote church at San Jorge Sintaná, El Quetzal, San Marcos, ignoring sound equipment, and only taking an icon of San Jacinto. Mexican historic heritage at the canyon of Metlac is suffering looting. the country’s first railway is under threat. The electrician says that 271 works by Picasso were given to him by the artist or the artist’s wife. Picasso’s heirs suspect otherwise. The incident took place in the east in Sarre-Union but this is not the first time that Jewish cemeteries in France have been defaced. Ritratto di Isabella d’Este, which was found in a Swiss bank vault in 2013, had been missing for centuries. It disappeared again, but this summer turned up as part of an insurance fraud investigation. Yet Carlo Pedretti, a da Vinci expert, says that he never authenticated the piece even though it is being reported that he has. The 500 books, including 1st editions of Galileo and Copernicus, were stolen by an Italian librarian from the Girolamini library in Naples. It will be interesting to see what that action will be. The Portable Antiquities Scheme is under threat due to local budget cuts for heritage. Illegal metal detecting has been detected at Hadrian’s wall both on private land and on National Trust land. 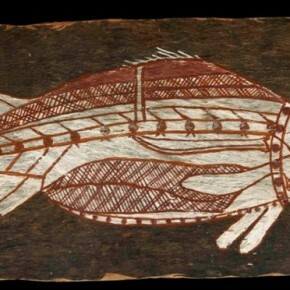 The bark art was taken from the Dja Dja Wurrung people of Victoria in the mid 1800s and are sacred to the people of the region. The last time they were loaned to Australia they were seized under Australian law but eventually returned to the British Museum. This one was taken from the Muthalamman temple in Ernamangalam near Kalasapakkam. The man is charged with over 30 temple thefts. Among the items recovered are sacred ornaments, gold ornaments, and two leopard claws. Same case as above. Turns out the man had the help of a 15-year-old boy who would stay in the temple and steal items while the man would take lodging near the temple and steal when opportunities came up. This is all in North Kerala. Cuneiform tablets from Iraq are always an issue. Contrary to what the museum in the article thinks, they are NOT ‘here for’ legitimising the illicit trade in antiquities by displaying them. Antiquities and architectural fragments found during the expansion of the Grand Mosque have NOT been being sold on the black market said the Presidency of the Two Holy Mosques Affairs. If I had money I would pay for reporters to stop using “Monuments Men”. The film wasn’t very good and the term is horribly gendered. A long piece on a controversial topic. An illegal excavation in a field in Yozgat’s Sorgun district resulted in the damage of previously undiscovered Roman mosaics. Taken from the entrance to the 1500-year-old Mamure Castle. The article claims the cannonball had been in that place for 400 years.